Here's a special treat for everyone enjoying this snow day. Maybe you are home like me (oh happy day!) or maybe you are stuck at work, but not under as many watchful eyes as usual. 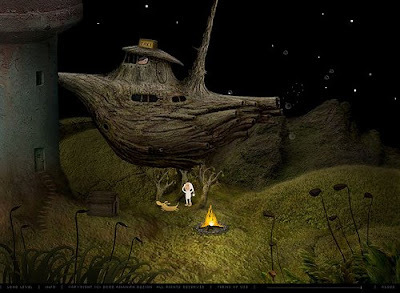 Anyways, above are screenshots from the coolest game ever called "Samorost." The animation is so beautiful. The game will drive you nuts, but once you figure things out you will feel like a smarty. I can't really give more info than that. Just click around and figure out what to do. Here is the link for Samorost 1, but I think I played Samorost 2 first (you can find that link at the top of the page when you find the link). Some things you will figure out quickly, but other tasks take forever! Write me if you get stuck and crazy. I will give you encouraging words (and maybe a hint). I fear i will become addicted to this game. Very cool illistrations.